Rob and I had two St. Patrick’s Day parties to go to last night. The first one we went to was at Professor Pablo’s house. I have a long history with Pablo, including sharing a room with him and his daughter for a month the very first time I was in Nicaragua. Before Pablo, I was decidedly disinterested in primates. My first year in grad school, I had to take a course with him on primate cognition and I wasn’t looking forward to it. Much to my surprise, I liked it and kept going. Throughout grad school, I’ve had my ups and downs. Mainly, a lot of downs at the beginning, and also during the year that I was writing proposals and preparing for pre-lims. If such a thing exists, I think I actually had a nervous breakdown in November of that year. I had thought nothing would ever be more difficult than Dunlap Love, but this thing came really close. There was this never-ending drama involving the toughness tester, my project in general, the seemingly impossible task of getting the proper research permits for Nicaragua, etc. More than a few times, I ended up in Pablo’s office, sobbing and practically catatonic. The thing is, Pablo is not my real thesis advisor. For parts of my grad school career, it has been him for all practical purposes, even though on paper its SL. This was so hilarious that I just about fell over laughing. 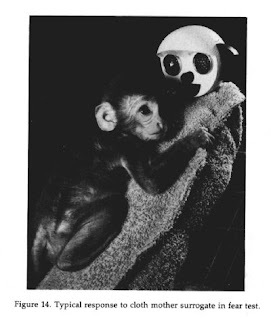 What Pablo was referring to was a truly horrific study conducted by psychologist Harry Harlow in the 1950’s. Harlow et al took newborn rhesus macaques away from their mothers to see what would happen. As one might imagine, the results were not pretty. They continued the study by creating “wire mothers” and “cloth mothers.” The wire mothers were these roughly monkey shaped things that were featureless and made out of wire, whereas the cloth mothers were monkey-shaped things that had faces and bodies covered with a soft, warm cloth. Results demonstrated that even when the wire mothers were equipped with bottles of milk and the cloth mothers had none, the baby macaques preferred the soft cloth mothers. Especially when subjected to fear, stress, or unfamiliar situations, the poor dears clung to their cloth mothers for comfort. Just imagining myself as a scared little rhesus macaque and Pablo as my cloth mother made me laugh so hard that tears were coming out of my eyes. I laughed all the way to the next party. I think Rob, who was not familiar with the Harlow study, was a bit disturbed. “Cloth mother!” I would roar, doubling over and dabbing the tears from my eyes. In retrospect, its still funny, but nowhere near as funny as I found it last night. Maybe that green cocktail Pablo fixed me was a little stronger than I had thought! In other news, I have decided that for various reasons, it is absolutely essential for me to run another marathon this spring. I’ve selected Madison (Mad-City Marathon) in the hopes that I will get to visit my little nephew on the way up there (will have to check with my sister to see if they will be around that weekend). In order to commemorate my newfound determination to run marathon #7, I flew through a 16 mile training run in the rain on Saturday. I felt no pain and even took 2 calls on my cell phone while I was running. Tonight I managed an 8-miler in the rain with some people from the running club. Again, the miles just flew by. Hopefully I can stay on this roll. Got to go, we’re in the middle of a laundry debacle here. Thanks for reading. In spite of the fact that I have no knowledge of primates whatsoever, I find this hilarious. And good luck with the training! We will be happy to cheer on Auntie M at the Mad City marathon! I just hope that they have the course well-marked!